Stay the night – the T-Rex won’t bite. 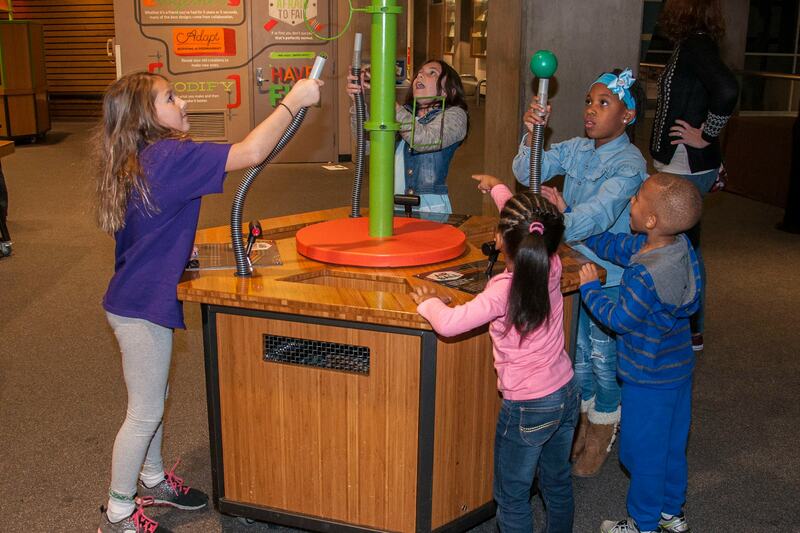 Ever had so much fun at the Science Center that you didn’t want to leave? Join us for an overnight Camp In and explore the Science Center at night. Activities are designed for children ages 6 and up. At least one adult chaperone is required for every five campers under 18 years old. Public Camp Ins cost $50/person. Please call us at 314.289.4439 for more information or to book. Groups of 100 or more may reserve a private Camp In – perfect for school and Scout groups. Groups under 100 may also book a program for a minimum event fee. Please call us at 314.289-4439 for more information. Check-in is from 6:00 PM – 6:30 PM. Festivities begin at 6:30 PM. The Camp In ends at about 9:30 AM the following morning. Sleeping under the stars at the Planetarium or beside our belived T-Rex. At least one chaperone is required for every five campers under 18 years old.